Home inspections have been uncovering much-needed property repairs. 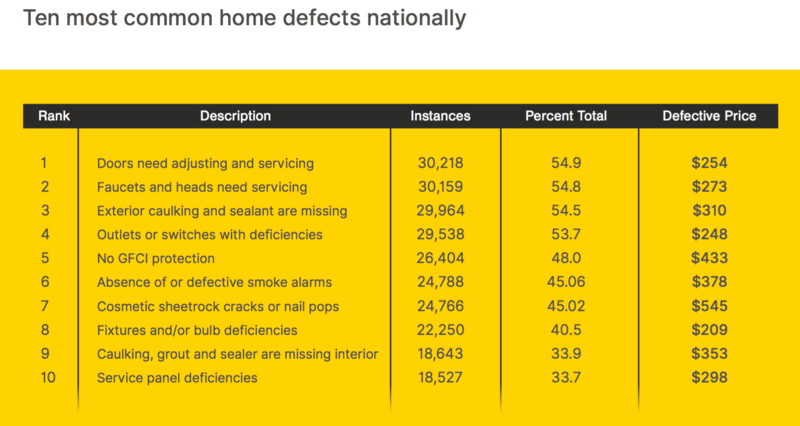 More than 1 million repairs needed more than $11,000 in costs, according to a February review of 50,000 home inspection reports by Repair Pricer, a home repair estimating resource. Nearly 55 percent of homes analyzed across the country had doors that needed adjusting, which could be an indicator of foundation issues, the report showed. More than half—or 54 percent—of the homes lacked exterior caulking and sealant, which could leave the home susceptible to extensive water damage. Furthermore, about 48 percent of homes lacked GFCI protection—this could pose a dangerous electrocution risk to homeowners around water-prone areas like the kitchen or bathroom. The most expensive home defects—uncovered in 9 to 20 percent of the homes studied—ranged in repair prices from slightly more than $1,000 to less than $10,000.